Additional details: Charge made for call-outs between 6pm and 8am and for fuel for long journeys. Plumbing, heating and drainage. I can offer a full range of plumbing and heating services from replacing a tap washer to installing a full central heating system. Special rate gas safety inspection offered which includes a full boiler or gas fire service with a free carbon monoxide alarm. All for the sum of £55.00. Definitely 100% recommended. Very friendly and efficient. Excellent price. I was delighted with their service and will use them again. Contacted Geoff with regard to some small plumbing jobs around the house. He promptly returned my call and then visited as arranged. Quoted for job and arranged date for work to be done. Arrived on time and with his son worked efficiently and left everything clean and tidy. Serviced gas fire. I will use for any future jobs. Came home to water dripping from the ceiling onto electrics, Geoff offered immediate advice to isolate the leak, then came out quickly to repair the leak. Clean, efficient and no fuss. Can't recommend him enough. Geoff and his son came on time, very professional and tidy workers. There were problems with the toilet cistern. I would definitely use them again and would also definitely recommend them. Excellent service. Geoff and his son turned up on time. They serviced my boiler explaining what they were doing and gave me good sound advice relating to the workings of boiler. Would definitely recommend. Geoff was excellent and professional. The work was to replace an old gas heater in the bathroom; Geoff came to see the job, gave me a quotation for the replacement, and we agreed an installation date a few weekends hence. Following a prompt arrival, he and his son put down dust sheets on the hall and stairs… this always impresses! They worked quietly, competently and with diligence. Geoff explained everything to me in a way I could understand, outlined the guarantee for the heater and left the instructions booklet with completed safety checks with me. I am delighted to have found someone who not only has the professional expertise and qualifications to do big plumbing and heating jobs, but says he is also happy to do smaller, handyman-type work. What a find! Geoff and his son are polite and pleasant, and take a pride in their work; I can't recommend them too highly. Thanks to both. Excellent service. Geoff rang two days prior to confirm appointment times. Two valves were needed, replacing on a towel radiator in the bathroom. They were clean, professional, pleasant and polite. Their pricing was very fair. I have no hesitation in recommending day. I will be back, many thanks. Geoff and son came as planned and did an excellent job. They came and left within the hour and I found them very pleasant. Absolutely delighted with the work that Geoff and his son Tom have done. After 8 months of being messed about by other plumbers we now have beautifully working taps! !Geoff and Tom turned up when they said they would - both times - and have been pleasant and very efficient and they've managed to solve an awkward tap/water pressure problem, for which I am very grateful. I have no hesitation in enthusiastically recommending them, and have several of their business cards for friends who have had similar disappointments with other plumbers. Worth their weight in gold but very reasonable charges - what more could you want! Thank you for getting our taps sorted out - very much appreciated. Excellent service from Geoff and Tom. Called back when they said they would and kept appointments. Thorough in their work and keen to do jobs to a very high standard. We had a kitchen tap and shower valve replaced. Based on our experience, I would have no hesitation in recommending Geoff to others. Of 3 quotes, Geoff's was by far the most thorough survey. He measured where pipes were, and which walls were involved. He considered all aspects of the job and as a result there were no surprise extra costs. He and Tom fitted a complete new central heating system for me, efficiently and carefully. They cleaned up after themselves every day and left everything tidy - Tom even hoovered on the last day! They arranged for all debris to be cleared, and also swept the drive. All aspects of the job and the new system were explained fully and all relevant paperwork and guarantees dealt with or sent off by Geoff. I would not hesitate to use them again, and have recommended them to several friends. Geoff and his son Tom always come when they say they will. They are the best plumbers we have ever had. They are clean, tidy, careful, efficient, safety conscious workers. Their prices are very fair and they are always pleasant and polite. Excellent service. Prompt for all appointments from initial survey and subsequent fitting of a new central heating boiler, which also involved relocation and associated additional work. 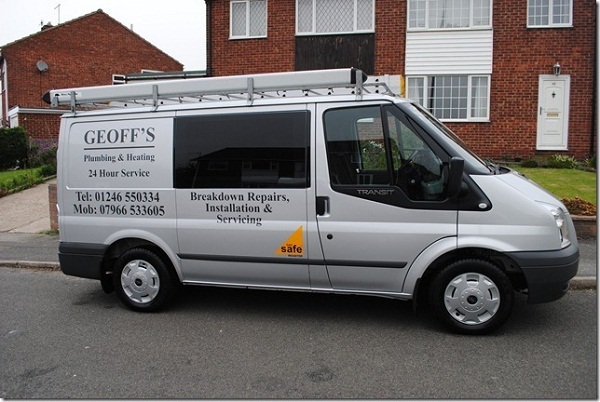 Geoff recommended the best combi model to suit our needs and the best site for it to be fitted. Both Geoff and Tom are polite, friendly, efficient and tidy workers. Geoff takes time to explain and answer any questions and checks customer satisfaction throughout. We are very pleased with all work undertaken and the performance of our new boiler. All paperwork regarding guarantees, warranties and building regulations compliance were processed and relevant certificates have been received. Geoff was recommended to us and we would not hesitate to recommend him to others. We have used Geoff since moving to the area in 2001. We have just had the boiler replaced and the service was excellent and installation went smoothly. Always considerate of his surroundings and works cleanly. Many thanks. Geoff and his son are hard workers and very professional. They care about their client and the work they do. I have employed them several times over the years for various reasons, ranging from big to small jobs and have always found them very reliable and hard working. I would recommend them without any hesitation. Had problems with the hot water, knocking for about 3 weeks after work carried out but Geoff very good and didn't wrap up the job till it was sorted. I am very pleased with the work. Geoff and his team have done a first class job, they were on time. Very respectful and kind and a pleasure to have in my home. Very tidy workers, I will recommend them to anyone. I have used Geoff several times and am really happy with the quality of work and the aftercare service I have received. During the summer, Geoff and his son came to us on three occasions and each time we were very pleased with the quality of the work done, also their professionalism and the courtesy shown to us. My wife and I have no hesitation in recommending them and will definitely use again. We're really happy with the work Geoff and Tom completed and would recommend them to others. Friendly, top bloke. Excellent service and great value for money. I would highly recommend Geoff's Plumbing & Heating. Everything was explained from the start of the project to the finishing. I found the people who did the work reliable and trustworthy also very flexible with working around my needs. Geoff and Tom did an extremely good job replacing our cistern and toilet plus one or two other jobs. They are very friendly and professional and it is great to find tradesmen who are clean and tidy and take a real pride in their work. Would definitely recommend them to other people. They were very good and I was highly satisfied with the work they did. Would recommend them. Third or fourth time we have used this trader. Geoff and his son Tom, arrived on time, removed the old radiator and took care not to let water leak onto the flooring as it was carried downstairs. The replacement was installed quickly and everything chec ked to ensure correct operation. Great service. Also serviced our boiler installed by Geoff and Tom last year . Anyone thinking of updating to a combi boiler might be interested in this: In the year since we had our combi boiler and system fitted we have had our monthly energy bill direct debit payments reduced by almost 50 pounds. We are actually on a slightly higher gas tariff since the unit price increased at the end or our last contract with Ovo for last 2 years so would have been even bigger redu ction. Our new radiators are brilliant too - heat up rapidly and belt out loads of heat. - actually cannot stand to have them on more than half way and some we leave off all the time - obviously they are off for the Summer.In short, best thing we have eve r done, cannot believe the difference it has made. Third or fourth time we have used this trader. Geoff and his son Tom, arrived on time, removed the old radiator and took care not to let water leak onto the flooring as it was carried downstairs. The replacement was installed quickly and everything checked to ensure correct operation. Great service. Also serviced our boiler installed by Geoff and Tom last year. Anyone thinking of updating to a combi boiler might be interested in this: In the year since we had our combi boiler and system fitted we have had our monthly energy bill direct debit payments reduced by almost 50 pounds. We are actually on a slightly higher gas tariff since the unit price increased at the end or our last contract with Ovo for last 2 years so would have been even bigger reduction. Our new radiators are brilliant too - heat up rapidly and belt out loads of heat - actually cannot stand to have them on more than half way and some we leave off all the time - obviously they are off for the Summer. In short, best thing we have ever done, cannot believe the difference it has made. I cannot recommend this trader highly enough - totally expert, skilful, reliable, friendly and excellent.